This year, our Gymnasium is celebrating its anniversary - 150 years. We are extremely proud of the history of our school and would take a great pride in sharing it with our Guests. Upon entering the Gymnasium, one will surely meet the sight of the portrait of Eugenia of Oldenburg welcomingly hanging on the wall. 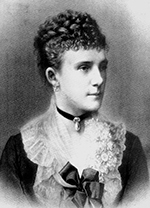 This woman is the patroness of our Gymnasium, the founder of the school and the person Gymnasium is named after. Her family tree dates us back to her grandfather, Nicholas I, and her father�s stepfather, Napoleon Bonaparte. As a descendant of two royal families, she always did everything as a queen would do: with confidence and vigor. So, when in 1868 she founded the Gymnasium, she invested all the efforts to make the place as perfect as she wanted it to be, taking an active part in everyday life of the Gymnasium and developing school curriculum in the new subjects, like Hygiene or the First Aid. In September 1901, the official school year was started in the new building. One of the contemporary magazines named it �the Cathedral of Enlightenment�. 1917-1941: New country, new ideas, new enthusiasm! The October Revolution was truly a time for new aspirations. Under the red Revolutionary flag, it was a time to bring a change to the people, and the Gymnasium was no exception. 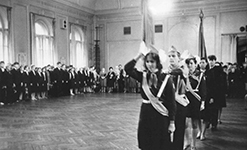 The former Gymnasium for girls was transformed into a united labor school. Since that time, the school became a mixed one: both boys and girls from working-class families could study and broaden their horizons there. A special attention was paid to the labor and physical education: diverse sections were organized within the school to promote the importance of having sound mind and body. Still, the core of the school remained untouched: more than a half of the staff and teachers had been working here before the October of 1917. In the pre-war time, much attention was given to the patriotism. For that reason the majority of students of High school joined the army voluntarily to defend Motherland in the World War II. The siege of Leningrad. A fight for one of the last bulwarks opposing the tide of fascism. The harrowing dread of the airplanes above was not yet to retreat, and the city had to hold on for 3 more years. 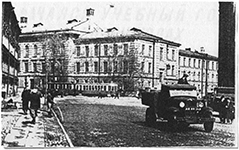 The students of school # 157 were evacuated from the besieged city. The 8th Artillery School now was located in the building. The cadets, as everybody else in the city, carried the bulk of defense. They patrolled streets of the Smolny district, guarded the building of our school, and extinguished fires. Many of them sacrificed their lives. A heroic exploit was performed by Yury Gapeev near the suburb of Leningrad. Surrounded, he took the last grenade and blew himself up with the enemy soldiers. As the resources were shrinking, the cadets had to combat famine and frost. On the 8th of February 1942, the cadets were finally evacuated from the besieged Leningrad. In spring of 1942 the staff and teachers started to prepare the school for the new school year. They had to repair all what was shattered by splinters of bombs and fire. Once a 52-kg bomb hit the roof of the school, but fortunately failed to explode. A mournful list of 15 surnames of teachers and school staff, who passed away during the siege days, tells us the grim story of those days. The time heals all wounds. And time, coupled with optimism and enthusiasm, heals twice as effective. Anatoly Isaev, the new headmaster of the school, has proven it only too clearly. Ruling the school for 21 year, he dedicated all his efforts to his mission just as Eugenia of Oldenburg did a century before. 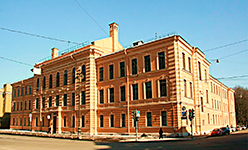 Even his flat, part of which is restored for the school museum, was situated inside this building. After the lifting of the siege school life came to order very quickly. In 1944 the school became the one for boys. In 9 year time, the doors of the school were opened up for girls as well. The goal of Anatoly Isaev was not only to restore the school, but to make its curriculum modern and cutting-edge. So, since 1963, a special heed was paid to learning English. 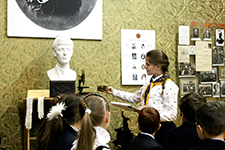 �Isaevskaya� school used to be one of the best schools in Leningrad, and it was for a reason. The 21 years of Anatoly Isaev have shaped the school. The sound command of English enabled the students to found the Club of International Friendship. They kept in touch with students all across the globe, writing letters and receiving small packages from their pen friends. After Perestroika has broken the bonds of mutual distrust, the relationships with foreign countries have been enlivened. In 1990, the first group of students from our school paid a visit to the city of Palmyra, Pennsylvania. Teachers of English enjoyed the opportunity to get acquainted with the American methods of teaching, no say nothing about the experience of cultural exchange. In 7 year time, in the spring of 1997 the 1st Saint-Petersburg Model United Nations Conference was held. This was a milestone for our Gymnasium: from now one, the students from numerous countries came to our school, and vice versa. Finally, in 1999 the school regained its historical name and became �The Gymnasium named after Princess Eugenia of Oldenburg�. The rest is history.